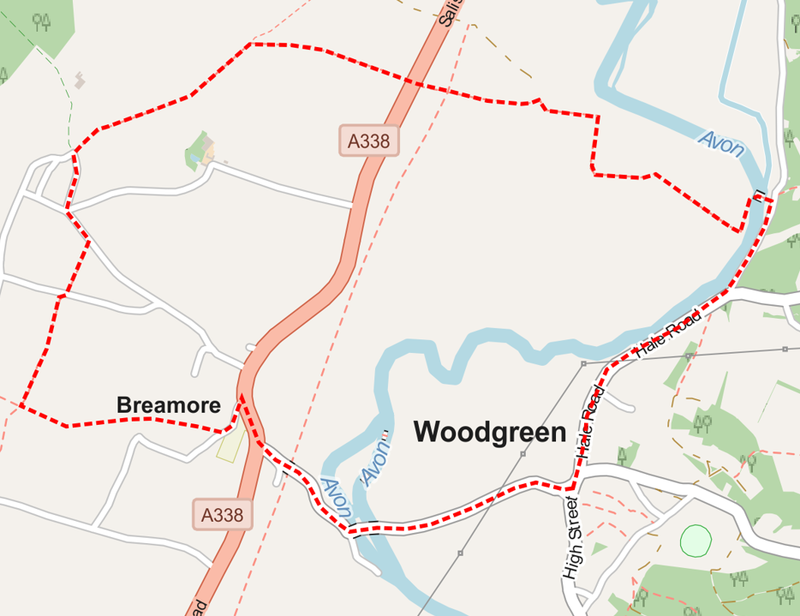 A 4.9 mile walk across the Avon Valley’s watermeadows from Cow Bridge to Breamore Church, returning to Woodgreen by Breamore Marsh and the Mill. The watermeadow channels were originally cut in the 1690s to carry water onto the pasture. It had been learned that a steady flow of water protected grass from frost during the Spring, promoting a valuable early crop of hay and extra yields through the year. The Avon Valley from Salisbury to Christchurch was extensively developed at this time and was perhaps even canalised to bring sea trade directly into Harnham. Start/End Start at the Horse and Groom, continue north along Hale Road, past the Shop. Moot Lane Turn left at the junction along Moot Lane. Cow Bridge Go left over Cow Bridge and climb the stile into the field on the other side. Follow the track over a small wooden bridge and then bear right before the next one. Watermeadows Bear left at the far end of the watermeadows and follow the fence line over bridges and weirs to a track. South Charford Farm Follow the track and turn left, opposite a bridge, through a field to South Charford Farm. Farmyard Turn right and then left and continue through the farmyard, between barns, passing through a gate into a field at the far side. Railway Cross the field to a stile and go through the two gates onto the old Downton-Breamore railway line. Small Bridge Cross the next field in the same direction to a small bridge. Cross this and the small road. Continue through the hedge carefully to the A338. A338 CAREFUL! Traffic is moving very quickly along this stretch of road. When it is safe to do so, cross the road and go through the gate opposite. Gate Cross the field to the gate and then continue along the same line to another gate on the far side of the next field into the wood. Yarnfield Wood Bear left through the gate and follow the path. This can be overgrown with nettles. Gate Continue through the gate and cross the field keeping the fence on your right. Gate Continue through the gate and head for the gate on the far side of the field. Gate Another gate – carry on across the field to the church. Breamore Church Go through the gate into the churchyard. Continue around the path to the main entrance. Crossroads Cross the road and continue. Stile Take the footpath into the field on the right. Stile Turn right and continue up the road for 50m. Footpath Turn left along the path and continue across two fields. Field boundary Turn left at the end of the second field and continue around it. Breamore Marsh Cross the marsh around the right boundary of the cricket ground and continue to Breamore School. Breamore School Join the track and continue past the school to the A338. Cross the road and walk past the Bat and Ball to the Woodgreen road junction. Woodgreen turning Take the road to the right of the railway bridge, past Breamore Station, rejoining the road back to Woodgreen.